Could Greece Fire Off a Global Credit Freeze? Pedestrians pass an entrance to the Greek finance ministry in Athens. European stocks declined from a five-month high as the region’s finance ministers failed to agree on a debt-swap deal for Greece and called for a greater contribution from bondholders. 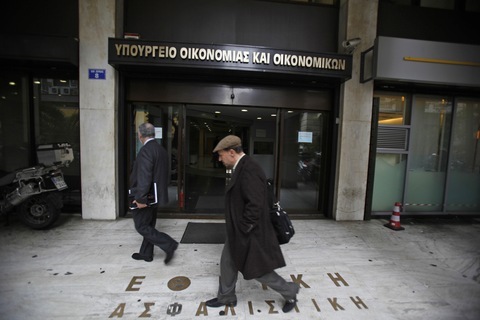 Photo by Kostas Tsironis/Bloomberg via Getty Images. Richard Linnemeier asks: What harm would the execution of credit default swaps for Greek debt have? What value do these instruments have to the buyer and to the global economy if they are not enforced? As to the execution of credit default swaps, 2008 was also a good year for explanation. Because it was the inability of AIG to meet its obligations to pay off the investors to whom it had sold credit default swap insurance that caused its demise, and was deemed so threatening to the global financial system that the U.S. took over AIG. See “Falling ‘Domino’ of U.S. Economic Issues” for a sketch of the doomsday scenario. These days, the fear is that institutions that sold insurance on Greek debt — Greek credit default swaps — will be obliged to pay up if Greece were to officially default. And that they won’t be able to meet that obligation, leading to global credit freeze 2.0. Indeed, this has been a major issue in the Greek debt negotiations, which have hinged on investors taking a “voluntary” haircut of as much as 70 percent on their Greek bonds — i.e., an agreement to reduce the principle and interest. Should enough investors do so, Greece would not technically default and thus credit default swap insurers wouldn’t have to pay up. But it’s still up in the air as to whether Greece will reach the necessary percentage and the deadline appears to be March 20. One more wrinkle. Greece is threatening to force recalcitrant bondholders to accept the new deal. If it follows through, that might trigger a default. Then again, most of the world has an interest in preventing such an event. Litigation would seem inevitable.